File photo: Queen Elizabeth II arrives for the state banquet in her honour at Schloss Bellevue palace on the second of the royal couple's four-day visit to Germany on June 24, 2015 in Berlin, Germany. Queen Elizabeth II on Wednesday canceled her plans to travel by train to Sandringham, her country home a hundred miles north of London, for the Christmas break, due to a cold. "The Queen and The Duke of Edinburgh have heavy colds, and so have decided not to travel to Sandringham today," the Buckingham Palace said in a statement about the royal couple. Photographers waiting to take photos of the 90-year-old monarch at the train station were told “It’s not happening now,” half an hour before the service to King’s Lynn was due to depart, The Daily Express reported. 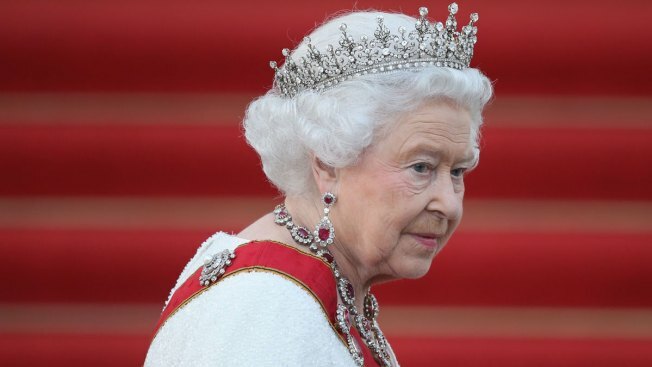 On Tuesday the Palace said the queen, who has reduced her travels, will step down from her role as patron of more than 20 charities and organizations at the end of the year. The Palace said she will follow her husband Prince Philip's example and reduce her charitable work at the end of her 90th birthday year. He did the same when he turned 90 in 2011.